South-America will enjoy a party experience as the world’s biggest electronic music festival lands in Buenos Aires and Santiago this month. Ultra Music Festival, known for its massive Miami events, continues its global expansion and for these events Dutch label Armada will host its own stage. On Saturday February 23, the Armada stage will land in Buenos Aires, Argentina and Santiago, Chile. Next to Armin van Buuren and Dash Berlin, who will headline both editions, Armada Music also serves its own portion of artists. 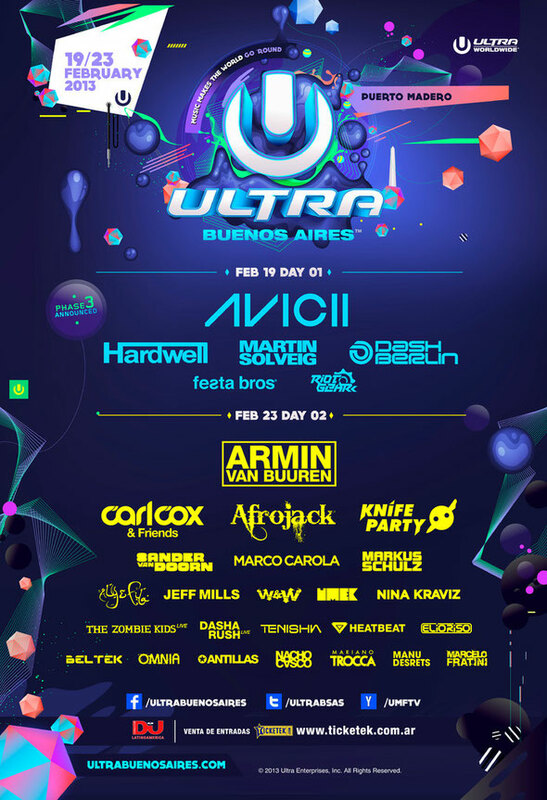 In Ultra Buenos Aires, with the beautiful Puerto Madero as the scenic location, Armada hosts Markus Schulz, Aly & Fila, Heatbeat, Omnia, Tenishia, Antillas and Marcelo Fratini, who fly in from the US, Egypt, Ukraine, Malta and Italy. For Ultra Chile, representing the label will be Shogun, Alex M.O.R.P.H., Chris Schweizer, Tomas Heredia , Soul & Senses and singer Betsie Larkin, for DJ sets at the Espacio Broadway. For more info, check www.ultrabuenosaires.com or www.ultrachile.com.